Zarpe en la goleta Appledorepara disfrutar de un crucero de dos horas de Key West. Únase a la tripulación para izar las velas, gire el volante, o simplemente disfrute de las vistas de la pintoresca costa de Florida. Puede elegir entre un día de navegación para un máximo de la luz del sol, o puede optar por un atardecer en la primera hora de la tarde, disfrute de una selección de bebidas durante su estancia en el agua. Elija un crucero de día o atardecer. Incluye cerveza, vino, cócteles y refrescos. Puede elegir entre un día de navegación y al atardecer, a continuación, desplácese por sus propios medios hasta Key West, el histórico puerto a bordo del Appledore,una de dos mástiles goleta de madera que ha navegado por todo el mundo. La tripulación le invitará a bordo y le mostrará la amplia cubierta, donde podrá tumbarse bajo el sol, o le ayudará a prepararse el barco para navegar. Premium, cerveza, vino, cócteles y refrescos que se servirá durante el día para navegar por el puerto, y al atardecer también cuentan con una fuente de queso y champán. Durante su estancia a bordo del Appledore podrá disfrutar de una relajante combinación de swarm la brisa del océano, su abundante luz del sol y las increíbles vistas del océano. Este recorrido de 2 horas en Cayo Hueso el crucero termina en el punto de partida original. Katie and the crew were fabulous! Very beautiful schooner which took us on an exciting adventure! The food was delicious and the adult beverages were perfect! We cant say enough about this experience! Please dont miss it! You wont regret it! The tour was colossal and absolutely breath-taking to be able to observe first hand the beauty of the sunset on the water. Additional bonus was seeing some turtles popping their heads up through the water as well as a Hammerhead shark running through the water. 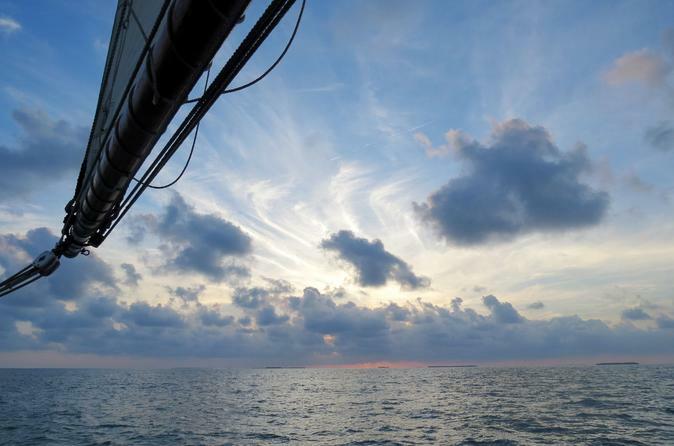 We had an amazingly still water and calmness of the ocean as we sailed and watched the sun set. A slight haze assisted in the elegance of the views as the sunshine against other boats provided a glimmering affect in the distance. The crew was phenomenal and attentive to any needs with extraordinary service to all and Captain Kate was absolutely over the top wonderful as a guide, host and made the trip highly enjoyable with a sparkling personality and obvious passion for what she does. We had a wonderful time and would definitely repeat the experience on future visits. this was one of the best experience in life! very calming and friendly crews. great beer and breeze on a schooner sailing, not diesel driven yacht. 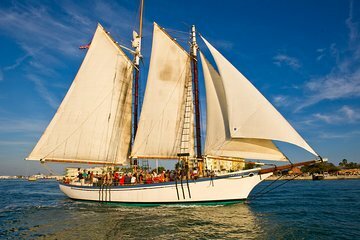 i strongly recommant this journey on the key west ocean! This was a two hour sunset tour, quiet, beautiful, smooth sailing! The crew did a great job in answering questions, telling interesting stories, and keeping everyone refreshed try the sangria - good stuff. The sunset was beautiful as always. Highly recommend. We've encountered some troubles in entering the boat which is why we only give 4 stars. We've been sent from one agency to another and back, spend half an hour finding the agency in charge, only to hear a lady panicking 'your boat is leaving NOW' but we couldn't go there yet because she made us fill in two forms. All was very stressy and we were really uncomfortable because the boat sailed out with 3 passengers and had to come back for us. The crew was understanding and friendly and the trip was really amazing. So peaceful! We've even managed to spot dolphins which was beautiful. There was no singer and no explanation about his absence but the cruise was great nontheless. Schooner Appledore was the highlight of our Key West trip. It will be the first thing we book when we return next year. Captain Chris with crew members Jan and Phil were so wonderfully professional attending to our safety and comfort. They were very handy with filling our drink cups, too! It was lovely being out on the water at sunset. Helping pull the lines to put up the sail was a rush for our party. It was awesome! The crew was very friendly and fun. Wonderful experience and we would definitely do it again! The Schooner Appledore ship and crew were exceptional. The absence of a fifth star is because the booking agent was terrible. They lost our reservation even through it was paid by credit card. Nothing more stressful than booking an excursion on line, traveling 1500 miles, and being told we do not have a record of you reserving your three paid positions. We were then able to straighten out the issue by going directly to the to the booking office. One young lady was useless, but there was an agent that rebooked us. My review of the schooner is great. The crew was friendly and made you a part of the crew. It was an experience we will remember!